I'm looking to make transparent GIF-like animations for webpages. However, saving transparent GIFs for webpages causes all sorts of problems - the most prominent being a white halo. If I can save all of the frames as a PNG strip, I can have the js run the animation and avoid any problems. My question pertains to the fact that I don't know how to generate these strips. I know I can save it as a GIF and then use other software to generate the strip. However, saving it as a GIF produces the transparency problems so I'm trying to save it as a strip directly. Is there a way to save a timeline in Photoshop into a PNG strip? 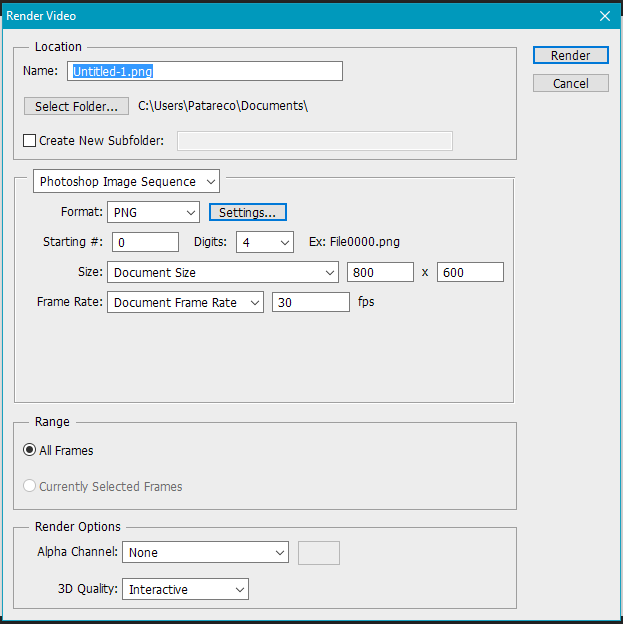 Select "Photoshop image Sequence" and the format to "PNG". Then in order to produce a Sprite Sheet I think your best option is to use something in the likes of the HTML5-Photoshop-Sprite-Sheet-Creator and produce your sprite sheet via a Photoshop Script. You could also produce a compound Script that merges the two processes into a single task! Not the answer you're looking for? Browse other questions tagged adobe-photoshop png gif or ask your own question.